The Papal Basilica of Saint Peter, or just St. Peter's Basilica, is believed to be built upon the site where Peter, one of the twelve apostles, were buried. It was completed in1626 after more then ha hundred years of construction. 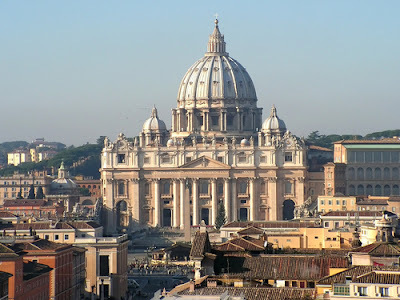 It has the largest interior of any Christian church and is considered the holiest of all Catholic sites. Aside from being built on the assumed burial site of Saint Peter, the church holds several other notable tombs. In the grotto beneath the church there are more then a hundred tombs, which of 91 belong former popes. Among the the most treasured features of the church is it's artwork. Some of it, like the 'Navicella', a famous mosaic set by Giotto, is partly lost, but it has been restored to it's original state.